The frail young boy was undersized for his age and sickly. His doctor recommended outdoor exercise. Although he certainly did not look like an athlete, the lad took up baseball, despite the objections of his overprotective mother. Though smaller than his teammates (as an adult he stood 5-feet-7 and weighed 140 pounds), he developed a muscular physique and compensated with his brain for what he lacked in brawn. As a pitcher he developed an ability to size up opposing batters and capitalize on their weaknesses. Fast on his feet, he was an excellent fielder and a good hitter. Soon he became a well-known performer on Chicago’s amateur teams. At the age of 19 he signed a professional contract, and Bob Caruthers, the once sickly lad, was on his way to big-league stardom. His star shone brightly but flickered out in less than a decade when his arm went dead. Robert Lee Caruthers was born in Memphis, Tennessee, on January 5, 1864, the son of Flora McNeil and John Caruthers, a lawyer. He had two older brothers and a younger sister. Sometime during the 1870s the family moved to Chicago, and Bobby made his reputation playing for the Lake View Union club on Chicago’s North Side. In 1883 he began his professional career as an outfielder with the Grand Rapids Rippers of the Northwestern League. The next year he pitched and played right field for Minneapolis in the same circuit. He was a right-handed pitcher and batted from the left side of the plate. Late in the season Caruthers joined the St. Louis Browns in the American Association and made his major-league debut on September 7, 1884, as a 20-year-old pitcher-outfielder. In the 1880s it was not unusual for a pitcher to play another position in the field when he was not pitching, but Caruthers and his teammate Dave Foutz did it more than anyone else. In his ten major-league seasons, Caruthers pitched in 340 games, played in the outfield in 366 games, and made 13 appearances at first base and nine at second base. In 1885 Caruthers turned in an amazing performance. He won 40 games, accounting for more than half of his team’s victories, as he pitched the Browns to their first major-league pennant. He led the league in wins, won-lost percentage, and earned-run average. The editors of the Baseball Encyclopedia honored Caruthers with the first of two Ex Post Facto Cy Young Awards as well as the first of two consecutive American Association Most Valuable Player Awards that year. After winning the 1885 pennant, the Browns faced the National League champion Chicago White Stockings in the “World’s Championship Series.” Caruthers started the first game, which ended in a 5-5 tie. He won Game Three, but lost Game Six of the controversial series, which had no clear winner. During the offseason Caruthers and a teammate, Doc Bushong, vacationed in France. While overseas Caruthers engaged in lengthy contract negotiations via trans-Atlantic cable, earning for himself the nickname Parisian Bob. In 1886 the right-hander won 30 games as the Browns took their second consecutive American Association pennant. He also played 43 games in right field. His exploits at the plate nearly matched his performance in the pitcher’s box. According to the official data released by league president Wheeler C. Wyckoff, Caruthers hit .342, tied for second best in the league. Modern researchers have adjusted his average to a still hefty .334 and calculated his on-base percentage at a league-leading .448. With the Browns Caruthers usually batted second behind the speedy Arlie Latham, but occasionally hit in the leadoff spot. At other times he could be found anywhere from third to ninth in the lineup. On August 16, 1886, he hit two home runs, a double, and a triple for 13 total bases. He is one of only a handful of pitchers to smash four extra-base hits in one game. An umpire’s call on a close play at first base deprived Caruthers of a chance to become the first pitcher to hit for the cycle.1 St. Louis again won the pennant and defeated Chicago in the World’s Championship Series. Caruthers pitched a one-hit shutout in Game Two and won two of three decisions. Although the Series was greeted with apathy in most of the country it generated a great deal of excitement in St. Louis, and enthusiastic crowds celebrated the winning of the “world’s championship.” A magnificent trophy presented by Erastus Wiman, owner of the New York Metropolitans, was proudly displayed in the windows of a downtown jewelry store. The Wiman trophy was given not for winning the Series, but for capturing the American Association flag. In 1887 Caruthers led the Browns to a pennant for a third straight year, winning 29 games against 9 losses for a league-best .763 winning percentage. He also allowed the circuit’s fewest walks plus hits per nine innings and played 54 games in the outfield. He hit .357 and had an on-base percentage of .463, reinforcing his reputation as one of baseball’s best hitting pitchers ever. In 1887, as they had each year since 1882, the champions of the American Association faced the National League titleholders in a postseason series. Billed as the World’s Championship Series, the contests were viewed as mere exhibition games by some of the players and with good reason. For example, the 1887 series consisted of 15 games between the Browns and the National League champion Detroit Wolverines, played in several different cities. One day the teams played a morning game in Washington and an afternoon encounter in Baltimore. In order to relieve the monotony of the travel and the meaningless (to them) games, some of the St. Louis players engaged in recreational activities that may have taken precedence over their preparations for baseball. At least that was the opinion of Chris von der Ahe, owner of the Browns. As Caruthers was an expert billiards and poker player as well as something of a carouser, the owner placed the onus on Parisian Bob for the loss of the series 10 games to 5. He put Caruthers on the market. Two years earlier, in 1885, King Kelly had been sold by Chicago to Boston for the unheard-of price of $10,000. A report from Chicago on December 15, 1887, explained the transaction: “It has finally been decided that Bob Caruthers will go to Brooklyn. The great pitcher met Joe Pritchard and C.H. Byrne at the Clifton house yesterday, and affixed his signature to a Brooklyn club contract. Monday night Pritchard and Byrne called on Mrs. Caruthers, Bob’s mother, and in a lengthy interview, did their best to overcome her objection to her boy going to Brooklyn. The real work of negotiating with and signing Caruthers was left to Joe Pritchard of St. Louis, but when it became necessary to obtain Mrs. Caruthers’ consent Byrne was detailed to do the talking. When Pritchard and Byrne went to their hotel Monday night they were not exactly certain as to the result of their endeavors, though they were confident, for Bob, after a quiet talk with his mother, had promised to meet them. He kept his appointment, and as soon as he arrived at the hotel, he agreed to sign. After he had made glad the hearts of the Brooklynites by this feat, he and Pritchard talked about the deal, but were very reticent about it. Before the start of the 1888 baseball season Caruthers married Mary “Mamie” Danks. They received wedding gifts worth $4,000, at a time when the average worker in the United States earned less than $500 a year. Several Brooklyn players tied the knot that winter, so many in fact that sportswriters took to calling the team the Bridegrooms. Caruthers had a good year in 1888, winning 29 games. He was even better in 1889, winning 40 games for the second time in his career, and leading the league in both wins and won-lost percentage as he helped Brooklyn win its first-ever American Association pennant. The diminutive hurler notched his second Ex Post Facto Cy Young Award from the Baseball Encyclopedia. He helped the Bridegrooms set a major-league attendance record. He lost his only two decisions in the postseason, as Brooklyn fell to the New York Giants. The Brooklyn club jumped to the National League in 1890 and won the pennant. Caruthers won 23 games, the last time he was to post 20 or more victories in a season. In 1891 he won 18 in his final season in Brooklyn. That was his final campaign in the Borough of Churches. He resurfaced in St. Louis in 1892, but his arm was nearly dead and he won only two games that season. However, he played more than 100 games in the outfield for the Browns. He also managed the club for part of the 1892 season, winning only 16 of the 48 games he managed. St. Louis released him in March 1893 and he played a few games for Chicago and Cincinnati that season before going back to Grand Rapids, where he had started his professional career ten years earlier. Some writers have suggested that Caruthers was unable to adjust to the new 60-foot 6-inch pitching distance that was introduced in 1893, but he was finished as a pitcher before that occurred. Although Caruthers’ pitching arm was shot, he was able to play a few more years in the minor leagues, mainly at first base, where it was not necessary to make many strong throws. In 1895 he managed the Jacksonville Jacks of the Class B Western Association, but was released in midseason. He started the next season as skipper of the Burlington Colts of the same league, but again failed to last the year. Caruthers wound up his playing career with the Western Association’s Burlington Hawkeyes in 1898 at the age of 34, getting into only three games that season. After his playing days were over, Caruthers tried his hand at umpiring. His record as an umpire was not nearly as distinguished as his accomplishments as a pitcher or hitter. He umpired in the American League in 1902 and 1903, in the Western League in 1904, and later in the Three-I League, moving consistently downward from the majors to Class A to Class B circuits. Often he was involved in controversies. Being involved in a controversy is not unusual for an umpire; it goes with the job. However, some of the disputes involving Parisian Bob were noteworthy. What the scribe did not know was that Caruthers was probably a very sick man at the time. He suffered a nervous collapse in 1911. Less than a year after the Waterloo incident another newspaper reported: “Pale and emaciated, Robert Caruthers, once an idol of the baseball world—a star pitcher—was sentenced to twenty days in the workhouse, the result of drink.”8 Caruthers never served his 20-day sentence, for he did not have that many days left in his life. On August 5, 1911, only two weeks after his arrest, he died at St. Francis Hospital in Peoria, the city where he and Mamie were living with her parents. Neither the obituary nor the newspaper accounts of his passing reported the cause of his death. The obituary said he had been ill for more than a month. Robert Lee Caruthers was 47 years old when his life ended. He was buried in Graceland Cemetery in Chicago. A new grave marker for Caruthers was installed there by the SABR 19th Century Grave Marker Project in 2018. At present Caruthers is remembered not for his unfortunate final years, but for the magnificent accomplishments of his youth. Among all the pitchers in the history of major-league baseball who won 200 or more games, only one—Whitey Ford—had a higher winning percentage than Caruthers. The Yankee left-hander edged Parisian Bob .690 to .688. 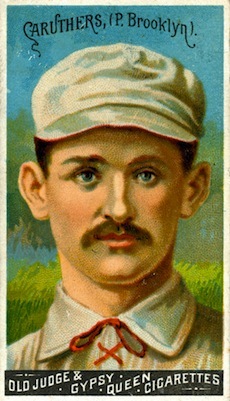 Among the pitchers whose major-league careers ended at the age of 30 or younger, Caruthers ranks second in wins, behind only Hall of Famer Amos Rusie. In the early years of the 21st century some baseball fans tried unsuccessfully to get Caruthers enshrined in Cooperstown. Faber, Charles F., Major League Careers Cut Short (Jefferson, North Carolina: McFarland & Co., 2011). Palmer, Pete, and Gary Gillette (eds. ), The Baseball Encyclopedia (New York: Barnes and Noble, 2004). Tiemann, Robert L., and L. Robert Davids, “Robert Lee Caruthers,” in Nineteenth Century Stars (Kansas City, Missouri: Society for American Baseball Research, 1989). 1 L. Robert Davids, Great Hitting Pitchers (Cleveland: Society for American Baseball Research, 1979). Retrieved from SABR.org on August 15, 2009. 8 Logansport (Indiana) Pharos, July 22. 1911.